It comes as a report from labour rights group China Labor Watch questioned the low wages earned by some Apple workers. Its 2015 Supplier Responsibility Progress report said it had told its suppliers in October that it was outlawing bonded servitude from the beginning of this year. Bonded servitude or labour sees new workers charged a fee - sometimes equivalent to a month's salary or more - for being introduced to a factory, typically by third-party recruiters. It means many employees will begin work in debt. Some have their passports confiscated. A BBC Panorama programme investigation last year highlighted the poor treatment of workers in Chinese factories. Undercover filming at one of Apple's factories - Pegatron - showed new recruits handing over ID cards, in breach of Apple's standards. Apple, which declined to be interviewed for the programme, denied the allegations of poor working conditions and long hours and said it was deeply offended by the allegations. On the same day that Apple published its audit, labour rights group China Labor Watch (CLW) released a report saying the company was unable to effectively monitor standards in some of its supply chain, allowing companies such as Pegatron to keep base wages below local living expenses. CLW based its findings on 96 pay stubs submitted by an unknown number of employees. It suggested that low pay compelled workers to put in more hours. 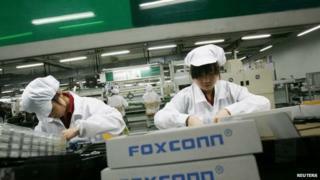 Conditions in Chinese factories were first highlighted in 2010 after 14 workers killed themselves at a factory run by Apple's biggest supplier, Foxconn. Long hours, harsh working conditions and low wages were said to be partly to blame. In February 2012 the hardware giant announced that its factories would be inspected by the Fair Labour Association (FLA). This is its ninth annual audit, and Apple was keen to show off the progress it has made in improving conditions. It said that it had tracked more than 1.1 million workers on average per week in 2014 and that suppliers had achieved 92% compliance with its 60-hour maximum working week. Apple has previously cracked down on excessive recruitment fees that foreign contract workers pay to labour brokers. It ruled that anything more than one month's wages had to be repaid. Last year suppliers repaid $3.96m (£2.57m) in excess fees to more than 4,500 foreign contractors, according to the audit. It also said that it continued to take steps to stop the use of minerals from mines in conflict regions such as those in the Democratic Republic of Congo. The company said it had more than doubled the number of verified conflict-free smelts to 135 last year. Another 64 were in the process of being verified.